Click Publish (in the Command Queue) to display the Publish Task window. Enter a descriptive name for the Task. This name will appear in the application logs. If the Wake-On-Lan option is enabled and at least one unit in the pool of target devices is powered on, that unit will send a Wake-On-Lan network event to other units in the pool. For further information, please refer to Wake On Lan page within Advanced section. The Task can be set to be executed immediately or at a later time. To schedule the task to run later, modify the Publish Start field. An end date can be defined using the Publish End field. If left empty, the Task will remain active unit all the agents complete the Task. If a date is defined, the Task will be stopped after the specified date, ensuring no other devices process the Task after the date. If at least one agent did not complete the Task within the execution period, the Task will be marked as Obsolete. When managing units that are not in the same time zone, it can be difficult to determine what time the Task is performed by remote devices. The Expected Execution Date provides the expected completion date based on the device's time zone. Modify the time zone according to the remote device's time zone. To make a Task recurring, tick the Recurring Task check box on the Publish Task window. Once published, the Task is stored in the Recurring Task section of the Library. Xcalibur W will then automatically create and publish occurrences of the Task according to the defined settings. Xcalibur W offers three different ways to select the devices for the task. These are the devices chosen using the tick boxes available within the Device List. These are the devices currently displayed on the first page of the Device List. 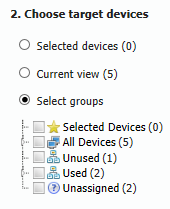 These are all the devices within the selected groups.